Corps Water Management System (CWMS) Deployment for the Willamette River Basin (OR) | WEST Consultants, Inc.
WEST Consultants assisted the Corps’ Hydrologic Engineering Center to enhance the decision-making and management strategies for the Willamette Basin Flood Control Project by incorporating advanced information technology resources to its operation plans. 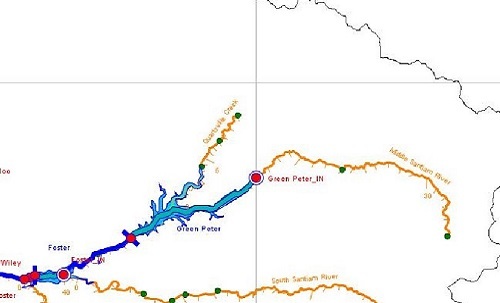 This project modified the existing HEC-ResSim model of the Willamette Basin projects, by updating operation schemes and increasing the resolution of data inputs and outputs to better represent flood control, fish passage, and power production operations. This new HEC-ResSim model was incorporated into the Corps Water Management System (CWMS), for real-time simulations during flood events. The new CWMS model provided a consolidated, seamless simulation of the entire Willamette basin that could operate in real-time using hydrologic inputs from the National Weather Service River Forecast Center. It spans eleven counties, contains thirteen flood control reservoirs, and has a basin area of over 11,000 square miles. WEST configured, calibrated, validated, and tested the ResSim component and stress-tested the overall CWMS model to confirm the real-time forecasting capabilities.